The Magisk manager is a manager used to modify the system settings with perfection and ease. It is like a mask which will alter your system. This app is used as an alternative to the app called Chainfire’s SuperSU. The Magisk manager is developed by Topjohnwu. If you already have the SuperSU on your system, then you would have found out that you are not able to use the banking applications. Are will be doubtful regarding the process of rooting? Rooting will give you some of the privileges and benefits to modify and alter the software code. The software codes are absolute essentials in a device when changed can allow you to use the functions and get access to the restricted advantages in a system. Mostly the manufacturers will limit the use of the apps using these complicated codes. You can read more about the process of rooting the phone on the internet. Many of the people are using Magisk because it contains some of the fantastic features. With the aid of Magisk app, you can use the apps without any difficulty. The default app used by many people nowadays is the Magisk app. 1 How to use Magisk v19.0? How to use Magisk v19.0? For instance, you have to use a banking application in your device. You find that whenever you are opening the application to use it, you see a notification saying that your phone is rooted and the banking application cannot be used because of it. Now to use the banking application, you will be forced to unroot the device, use the app and then again root the phone with the assistance of the app Chainfire SuperSU. The rooting and unrooting of the phone is a very long process and tough too. No one likes to do the rooting and the unrooting over and over again. What will you do if you want to use the banking app urgently in case of an emergency? Will you not be annoyed by the slow functions of the phone? You do not need to root and unroot the phone ever again if you use the app created by Topjohnwu. This will hide the root in the device making the apps work properly. The Magisk app works perfectly, and it does not change the partition in the device. If you want to install the applications related to banking and the OTA updates, use the Magisk app. You can install any kind of app which does not work in the rooted device with Magisk. As the name suggests, the Magisk is a very good manager of your rooted phone. There is a universal system less interface in the Magisk. If you have a desire to make a mod app, you can use the Magisk for this purpose too. Download and install this amazing app on your phone for the effortless performance. The download process of the Magisk app is really easy. See the download section of the app to see how to download and install it. 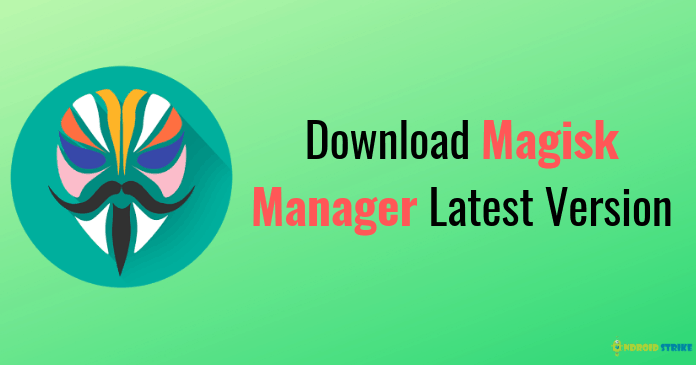 Download the Magisk Manager Zip from the above-given download button. If you download the latest link, then you may enjoy some of the updated features of the app. if you have a mobile version which is not recent, then you will also be able to download a version of Magisk app which is suitable for your device. Many of the links available on the internet for the Magisk app is reliable. If you are Android device user, you can easily get the Apk file of Magisk in your Android device or else you can download the latest version of Magisk Manager APK below. You cannot directly download Magisk manager into the Android device. First, change your security settings by enabling the “Download from other sources option”. When the download process gets over click on the installation button, proceed further. When allowing the app to access some of the phone information and accepting the terms and conditions, the app will start to install. Wait till the installation process is completely over and later you can see it on your home screen and use it. If you click the zip file showing the download you will be able to see the file which is downloaded. This will require your phone to reboot. You have to reboot the phone and use Magisk manager. Now enjoy the superb app Magisk in your phone. You have to download and install Magisk Manager Zip from the given link above. It will be downloaded in the form of a zip file. You have to place that in the internal storage of your phone. Make sure you know where you have saved he file on the phone. Reboot the phone in the recovery to be sure that you have a file such as the TWRP installed on the device. Click the install icon in TWRP Recovery on your device. You have to locate Magisk-v19.zip saved in the SD Card or internal storage. Now you can install this zip file onto the phone, and you have to wait to have it installed in your phone. You would have now flashed the Magisk-v19.zip on your phone. Reboot the device and check if it does work in your device. Open and see the installed Magisk app on your phone ready to use. The Magisk will not add any specific files in your device when it is installed. In this way, it is better than the other apps doing the same function. The Magisk is an app which is considered a system less rooting option for the phone. If you wish to root the device root it and add the Magisk app for better performance even when the phone is rooted, it is a very good assistance for your device when you are using the financial app on your phone which may not function when the phone is rooted. This app is very important to many users and developers of the phone because of its many useful features.